The US Open always posts their practice schedules on the app, which was really useful. I spotted Timea Bacsinszky was practising on court 6 with Kurumi Nara and Nicole Gibbs so that’s where we headed to start with. It was interesting to see three players sharing a court and it seemed to work well with the players honing their serve and returns. It was an enjoyable practice to watch and there was one funny moment – I was taking photos and Timea miscued a ball into the crowd standing on the side and shouted “watch out!”. I’ve become really fond of Timea in the past year or two, transfixed by her story, but even more taken by her game and endearing personality. Ever since I asked her a question in a press conference in Eastbourne (yeah, best moment of my life haha) she’s been a firm favourite. Pre-Eastbourne, I had absolutely no photos of Timea but now I have tons :-). It was an easy decision choosing where to start the day. 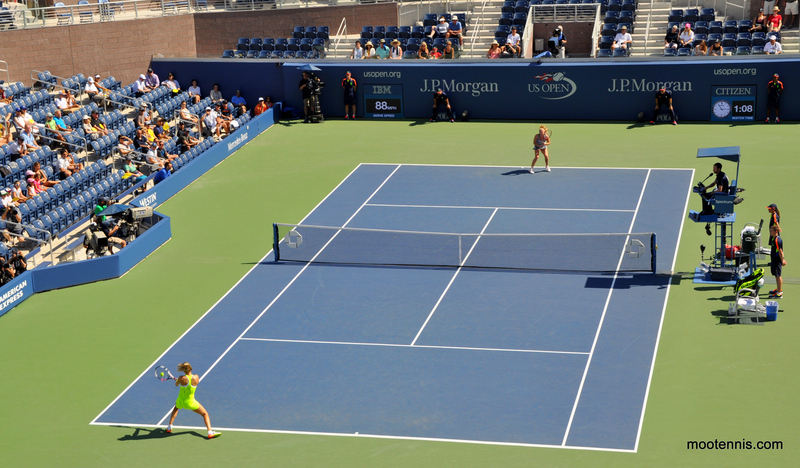 My favourite player, Lucie Safarova, was opening against Daria Gavrilova on the old Grandstand. 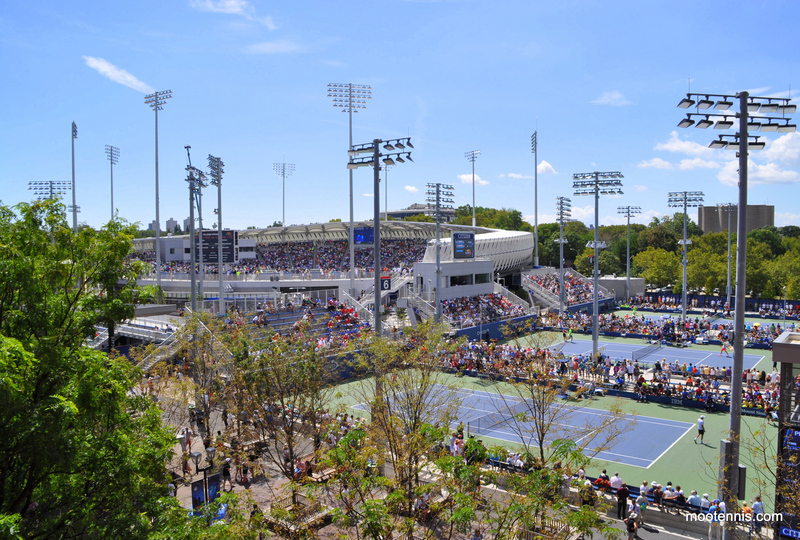 I felt like this was the perfect year to go to the US Open with the new Grandstand and Ashe roof in play, and I was even happier when it was announced that the old Grandstand would be used too as Court 10 was deemed not ready for match play due to court imperfections. We sat in the stand under cover, which was nice and cool! It wasn’t a great crowd but there was plenty of support for both players. I spotted Lucie’s coach, Rob Steckley arrive with Lucie’s sister and one of her nieces. The Czech Fed Cup captain, Petr Pala turned up midway through the first set. Safarova started the match in superb form, hitting the backhand beautifully. It’s normally the side that breaks down but Lucie was feeling the ball early and secured the early break. Gavrilova was struggling to find first serves early on but soon found her feet on serve. Safarova though was unstoppable on serve and dropped just two points behind it in the first set, which Safarova won, 6-4. Safarova missed a *0-40 opening on Gavrilova’s first service game but secured the break in the Aussie’s next service game. There were opportunities for the momentum to swing but Safarova stayed on top and was propelled by her serve. There was a contentious moment mid-set when Gavrilova tagged Safarova at the net. It was a heavy hit but Gavrilova was very apologetic and raised her hands in apology (see picture below). 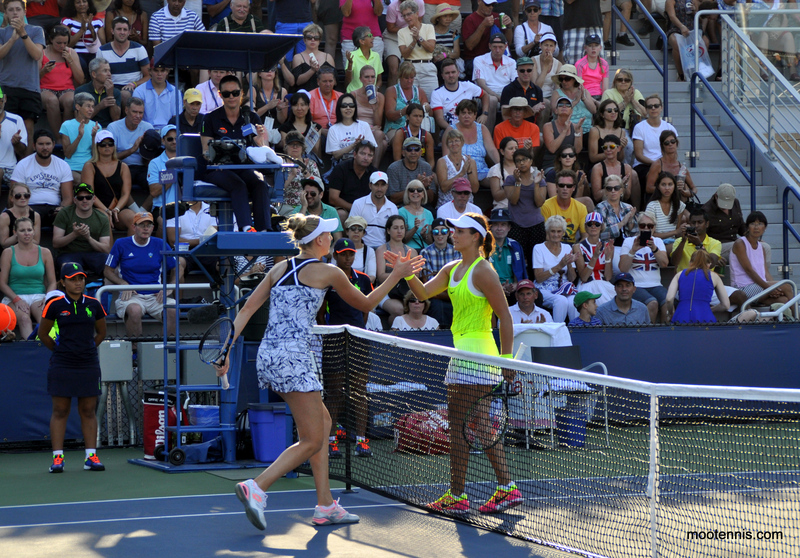 I noticed that when Lucie returned to the baseline, she did shake her head a little. For the first time in the match Safarova dropped her serve at *5-2, missing three match points in the process. Gavrilova held to 30 in the next game, winning four straight points. I was nervous when Lucie stepped up to serve for it for a second time! Gavrilova chalked up a break point, but Safarova held it together and served it out, prevailing on her fourth match point. There was a nice reaction from Lucie. There was also a decent handshake. The pair seemed to share some words at the net and it was good to see no hard feelings about the moment in the second set. I’m really fond of Dasha too and there was obviously no malice in hitting Lucie. It was a good start to the day to see Lucie win and I was chuffed that some of my pics were shared on her Twitter page :-). Before getting some lunch, we headed over to see a little bit of Alexander Zverev in action against fellow German, Daniel Brands. I’d read on Twitter that Zverev had already called for the supervisor so it sounded like fun! I’ve really enjoyed watching Zverev this year although I must admit his petulance on court is a concern. It reminds me a little of Bencic from a year or two ago but FAR more extreme. We watched Zverev win the third set where he was much more focused. Bacsinszky was playing Vitalia Diatchenko on Court 7 and by the time I found it (I may have got lost on the way haha! ), Timea had already won the first set. It was boiling hot but I was willing to deal with it to watch Timea. There was barely anyone watching the match so at least I could get a seat. Diatchenko had the doctor on court midway through the second set to check her blood pressure and give her some medication. Bacsinszky wasn’t playing anywhere close to her best and struggled for rhythm. Diatchenko has some big strokes but was very erratic, serving up many double faults. Bacsinszky lost her early break in the second set, but regained it and then consolidated on serve with a gorgeous lob. Bacsinszky sealed the win soon after, 6-1 6-1. Lucie and Timea had both won so I was a happy chappy! Next I popped over to the new Grandstand Court to see some of Eugenie Bouchard v Katerina Siniakova. It was hot by now so I opted to stand at the back of the court in the shade. When I joined the match, Siniakova was a set up but Bouchard had the break in the second set. It was a heavy hitting clash and it was clear who the crowd was behind… any point that Siniakova won was met with very light applause. Bouchard was clutch in the second set, digging out of a *0-40 hole at *4-2 and then saving two more break points to serve out the set, 6-3. Bouchard took a medical time-out for blisters in between the second and third sets when I moved on. I was a little surprised that Siniakova went onto win in three sets, 6-3 3-6 6-2. I adore taking photos of Siniakova and it’s impossible not to take some dramatic photos with the incredible head snap on her groundstrokes. I was enjoying my WTA fix during the day and headed over to Court 4 to watch the Wimbledon semi-finalist, Elena Vesnina play Anett Kontaveit. Vesnina had won the first set but Kontaveit was up a break in the second set. It was high quality tennis and big hitting from both. Kontaveit hit some crushing returns and secured the double break, cheered on by some Estonian fans. Vesnina had one verbal outburst but was on the comeback, getting one of the breaks back and threatening the second one. Kontaveit, who had strapping on both thighs, refocused to force a decider, 6-4. I continued to my sweep around the outside courts when Elena went off court but she eventually won, 7-6(4) 4-6 6-3. I headed over to meet my Bro and work pal who were watching the all-Brit clash between Laura Robson and Naomi Broady. They were midway through an intense opening set that was dominated by serve with no breaks. It was Robson, on a eight match winning streak, who was clutch to win the first set tiebreak, 7-6(4). 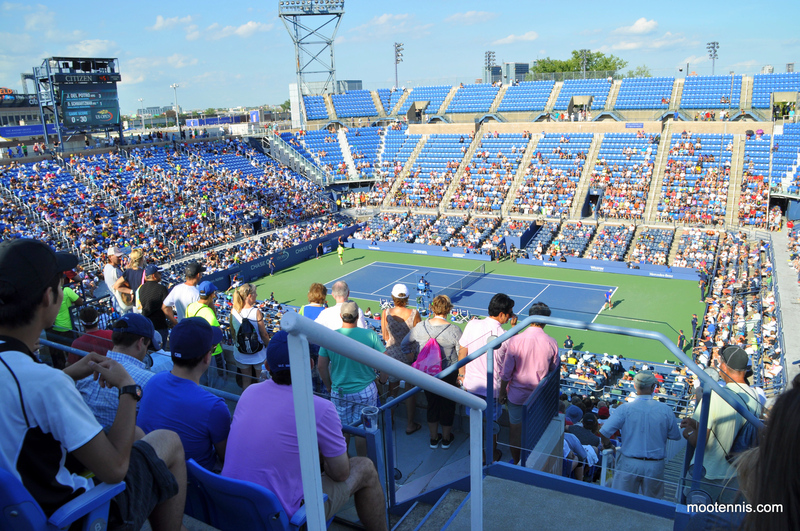 Tuesday involved a lot of moving around on the outside courts, dodging the sun and trying to see as many players as possible… next it was to Louis Armstrong Stadium to see some Delpo! Juan Martin del Potro was playing Diego Schwartzman in an all-Argentine battle. It was the best crowd i’ve seen on Armstrong and we once again opted to sit in the upper stands next to Ashe, avoiding the sun. This proved to be a mistake. There’s no security on the gates in the upper section and you can come in and out as you please, and in between points/games. It was really frustrating as there always someone coming in or going out. Furthermore, people kept gathering in the platform between the lower and upper stands and obstructing views for people sat in seats (see below). It was a solid match and anything with Delpo is always fun. I thought Schwartzman was playing much better than the scoreline but it was Delpo who won the opener, 6-4. Again, I felt the Armstrong crowd was flat and I just couldn’t get into the match so we left after a set. I was pleased to see Delpo won in straights, 6-4 6-4 7-6(3). 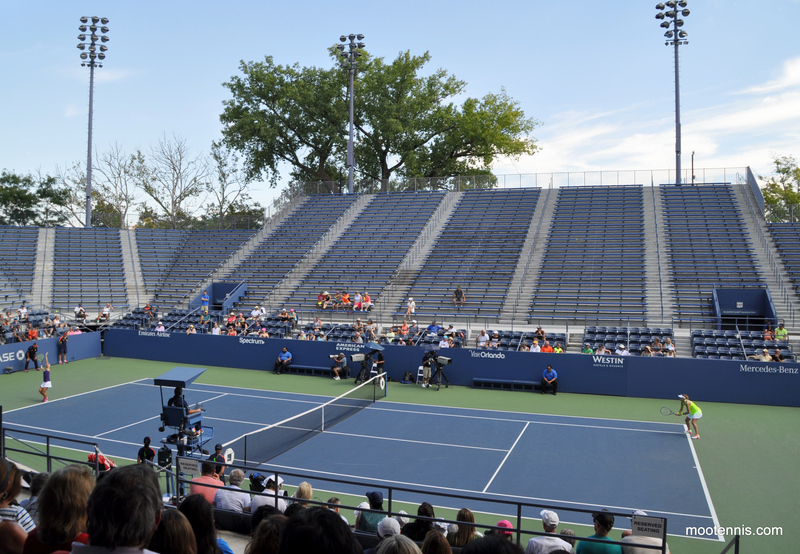 We headed back to a busy court 13 where Robson and Broady were embroiled in a third set. Robson was becoming increasingly frustrated on serve, constantly having to catch the ball on her serve toss. It was still going with serve but Broady was having the more comfortable service holds. As Robson stepped up to serve to stay in the match at *4-5, it all came crashing down. Broady broke to love to win the match, 6-7(4) 6-3 6-4. I was gutted for Robson who was clearly distraught at the loss. She never seems to cope with losses well (I understand!) and she was off the court in a flash. It was a good win for Naomi though in pretty tough conditions. Court 13 was always the hottest place I came across around the grounds and I couldn’t stand for longer than half an hour during the day. Over on the adjacent court 14, Laura Siegemund was starting her match against Patricia Maria Tig. Both were players i’d never seen before so I was snapping away. Siegemund’s a fun player to capture and watch. The only thing I remember from this match was when Siegemund randomly dropped her racquet. It made me think back to when I was playing tennis earlier this year and the racquet suddenly went flying out of my hand for no reason. I hurt my leg in the process haha! We headed back to the scene of the Niculescu-Strycova treat on court 5 where Kristina Mladenovic was playing Nao Hibino. We watched the end of the first set where the quality wasn’t so high. Mladenovic won the match, 6-4 7-5. Then it was back to court 13 to see the first set of Dominic Thiem against John Millman. I really enjoy watching Thiem and so do a lot of people it would seem as this attracted a large crowd. It was a bit crazy that a top eight seed was scheduled on this court, but it was a great opportunity for ground pass holders. Thiem looked comfortable early on so I was surprised to read that he needed five sets to win in the end. We were now killing time before the night session and since Venus Williams’s first round match against Kateryna Kozlova had gone the distance, it was delayed. We stood and watched some of the action on court 6 between Gilles Simon and Radek Stepanek. When a photographer moved on, we managed to get right to the front and could pretty much touch the court. It’s awesome how close you can get to the action. As is the case with most Stepanek matches, this was entertaining. Finally we noticed that the gates had been opened on Ashe for the night session so we headed over to where a sizeable queue had developed. I was so, SO excited for this and it was on my tennis bucket list to watch a night session on Ashe! We made it onto the court just before the players came out for the first match between Serena Williams and Ekaterina Makarova. 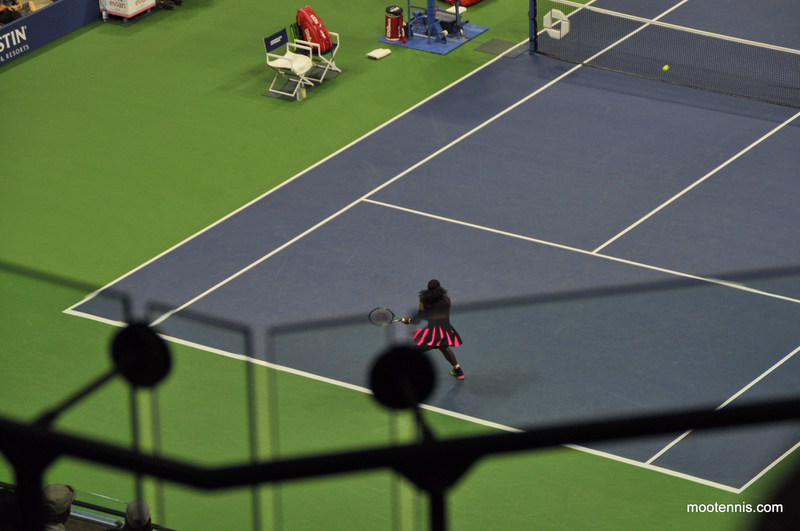 I was pleased to see Serena in action, who I hadn’t seen live since 2011. Immediately, it looked like the shoulder was coping OK as she flew through the first service game. Makarova kept things competitive for a time but the result never looked in doubt. Serena, buoyed by 12 aces, powered home for a 6-3 6-3 victory. I have to be honest and say that the Ashe night session was a little underwhelming for me. It was unfortunate that the stands were barely a third full for the start of the match, which was probably because people were filtering in after the delay to the day session. I was also disappointed about our seats as we had a glass screen that obstructed our view. I felt for the people below who must have had it even worse. I know at Eastbourne they have reduced prices for restricted views but nothing at the US Open! The atmosphere was also surprisingly flat… I think my expectations were obviously too high. There’s a strange vibe in the upper stands as there is no security so you can come in and out as you please. This can get grating with people wandering in and struggling to find their seats as points are going on. The crowd is often dis-engaged from the action and many people weren’t even watching the tennis. Perhaps we were unlucky to not get a more gripping match as for example, the crowd sounded amazing for Nadal-Pouille. The crowd did pipe up right at the end when Serena won. We tried to get a drink (the famous Grey Goose Cocktail) but the queues in the upper tier were so long that we gave up. We finally managed to buy some at the start of the men’s match between Andy Murray and Lukas Rosol… it was worth it! There was a promising start to the Murray-Rosol match as the pair played out a couple of lengthy rallies but Murray soon took control of the match. We stayed until midway through the third set when Murray looked in control. It had been another mad 12 hour + day of live tennis and we left feeling a little flat after the night session that hadn’t quite lived up to the expectation. I was really pleased to have experienced a night session on Ashe but was relieved we had only bought one night! We left in really muggy conditions, aware that Wednesday was going to be an uncomfortable one. 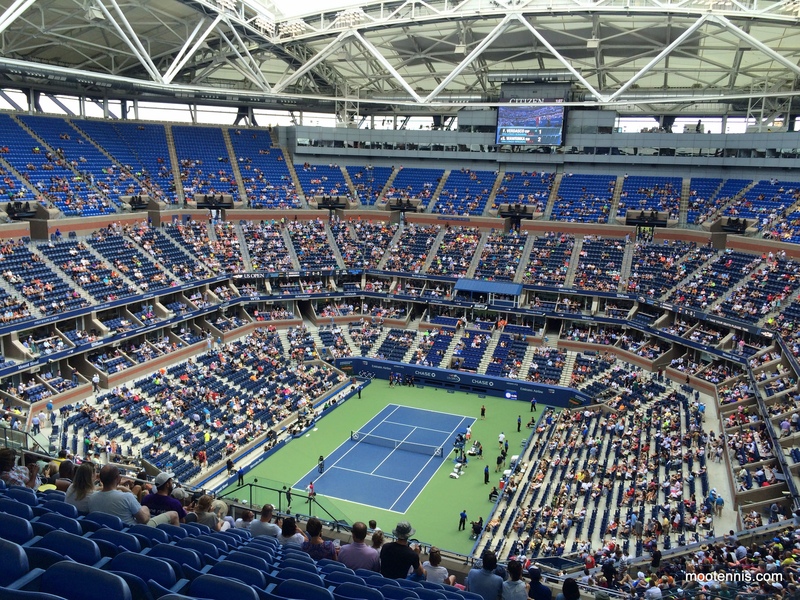 Still, I was really looking forward to a third and final day at the tennis where we just had Ashe day session tickets and could watch night matches on the outside courts. 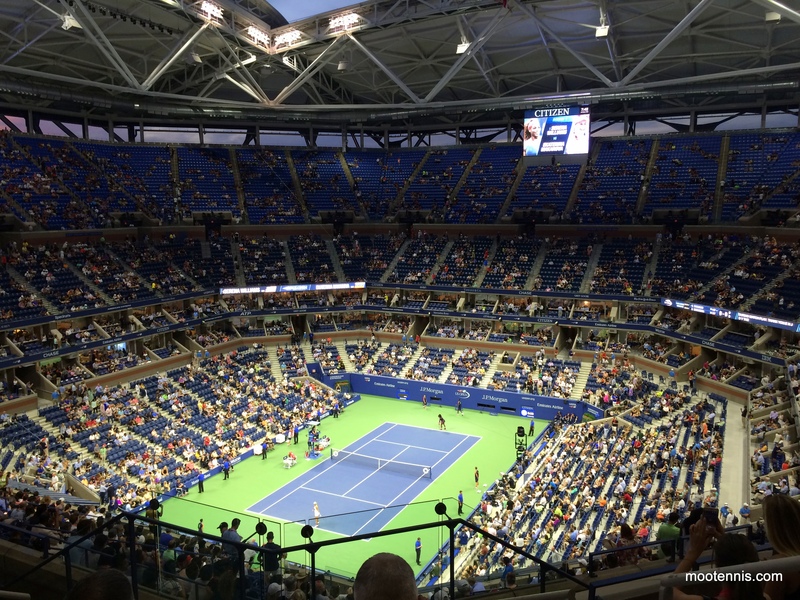 September 6, 2016 in ATP, Tournament Report, US Open, WTA.